According to the report, OFW Antonio Espares was kidnapped July 15 at a checkpoint in the Gwarsha district of Benghazi. OFW Espares remains were found at a hospital on July 19, 2014. The report comes just two weeks after three Europeans working for an Italian construction company were kidnapped in the western city of Zuwara. OFW Antonio Espares was an employee at Kibra construction company. July 24, 2014 – Sonia Bulong-Miralles, Coordinator, Women Programs, Asia Pacific Mission for Migrants (APMM), forwarded an email from Fr. Allan Jose Achebuche of Caritas on the excerpts of the conversation between him and OFW Antonio Espares on the incident. OFW Espareswas with two (2) co-workers (Libyan and Yemeni nationals) were intercepted by certain group wearing bonnets in a checkpoint on their way back to the jobsite. July 16, 2014 (Thursday) – the Company/Employer negotiated with the militia who demanded 20,000 plus dinar as ransom which the latter prepared. The following day, on July 17, 2014 (Friday), the Company/Employer contacted the group again and the hostage takers informed the former that they did not need the money, instead instructed them to pick up Antonioin a specified location. July 18, 2019, the Company/Employer went to the specified location and found out that OFW Espareswas already beheaded. The Espares couple has 7 children, namely: Jester, 16 years old; Judielle Ann Mae, 14 years old ; Joana, 13 years old ; Jennylyn, 12 years old; Jhon Loyd, 10 years old ; Janel, 6 years old, and; Jhon Denverr, the youngest is only one (1) year old. The wife, Maribel is currently working as enumerator at the City Hall of Taguig, earning P330 per day. OFW Espares was deployed last 16 October 2013. He had only been working in the company for nine (9) months when he was kidnapped. He was deployed by STB_DJL Human Link (formerly DJL Manpower, Inc.), 1011A (GF). B (2F) & C (3F) Remedios cor. Modesto St., Malate, Manila, Tel. nos: 521-4875/531-6636; Representative: Angelita V. Castillo. He worked as heavy equipment operator and earned a salary of 700 dinar per month. Because her husband was not able to send money for four months due to the unrest in Libya, Maribel is now heavily indebted. Maribel owes P20,000, with her ATM as collateral, payable within five (5) months at twenty (20 percent interest. She also owes another nineteen thousand pesos (P19,000) from an individual at ten (10) percent interest. All her salary goes to the lender. The reason why she filed a leave of absence from her job is to do laundry to buy food for her family and needs of her children in school. OFW Espares was able to contact his wife last July 13 and assured her that he will remit money at the end of July. OFW Espares, on the other hand, to be able to pay for his placement fee, borrowed fifty thousand pesos (P50,000) from a lending company. His loan had since been waived by the said company upon learning of his death. 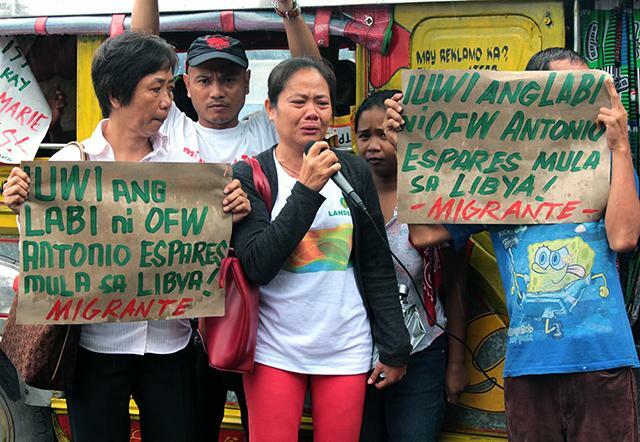 On July 19, 2014, a colleague of OFW Espares called his family to inform Maribel that something happened to Antonio. She was told that Antonio had been kidnapped. On July 20, 2014, OWWA RAD OIC Yolly Penaranda came to visit Espares’ house and talked to Maribel. She was told that her family will receive P200,000 plus P20,000 burial benefits of which the processing will take place upon receipt of the death certificate. She was also told that their eldest son Jester, who is currently studying vocational at ESDA, will be accepted in the Scholarship Program of OWWA. On July 21, 2014, she went to the Department of Foreign Affairs, Office of the Undersecretary for Migrant Worker Affairs (OUMWA). Maribel was able to talk to Undersecretary Jesus Yabes and asked what happened to her husband. According to Maribel, Usec. Yabes during their conversation, tried to divert the issue by making her laugh to pacify her. Later, Usec. Yabes informed her that her husband was kidnapped and beheaded. On the other hand, OUMWA Director Renato Villa contacted CDA Adel Cruz of the Philippine Embassy who informed him that the Embassy went to Benghazi to locate the remains of OFW Espares in a hospital. They said that there is difficulty in the repatriation of Antonio’s remains since Libya was already closed at that time. When asked if she already received concrete assistance from the government, Maribel said she received none. Maribel told Migrante that Taguig Mayor Lani Cayetano extended P20,000 assistance to the family and at least P5,000 from the recruitment agency. Out of her desperation, she went to ABS-CBN to ask help so that her husband’s remains will be repatriated but nobody entertained her since it was on a weekend. Joined the SONA rally with Maribel and arranged for media interviews. Wrote DFA/Philippine Embassy for updates, OWWA. August 5, 2014, held a picket and dialogue at the Department of Foreign Affairs. Wrote an appeal letter to ICRC and IOM for assistance – immediate repatriation of Antonio’s remains. Continuous coordination with networks in Libya for the facilitation of repatriation of Antonio’s remains and the urgent evacuation of stranded OFWs in Libya.